'Come to me and I will heal your broken heart.' These words, spoken by a sweet-voiced angel, lead Wulfborne into a dark and creature-filled underworld. As he battles his way through minotaurs, fish creatures and other strange monsters we learn that Wulfborne has lost the love of his life, Luna. He is now torn between dealing with the angel who has whispered that she will heal his broken heart and a promise that he made to Luna. Wulfborne the Adventurer travels the Underworld in an attempt to heal his broken heart! Monstrous adversaries block his way! Strange Travelers warn him back! But the bitter swordsman is determined to see this through...no matter the cost! Will he find what he seeks at the bottom of the Underworld or does something far deadlier lie in wait? 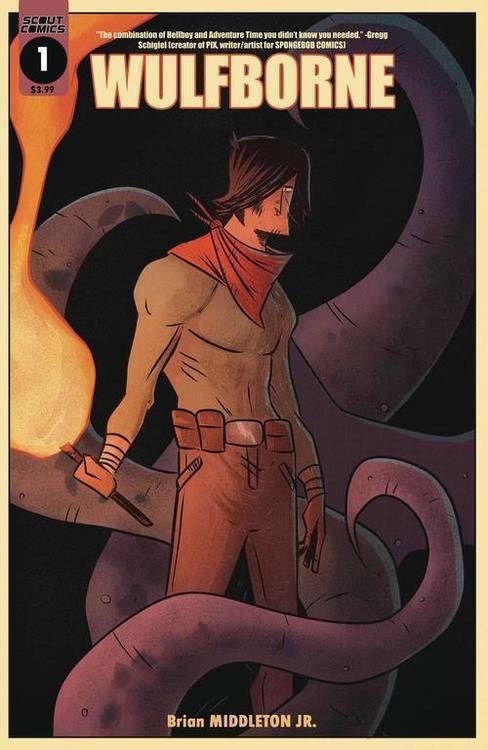 The combination of Hellboy and Adventure Time you didn't know you needed.